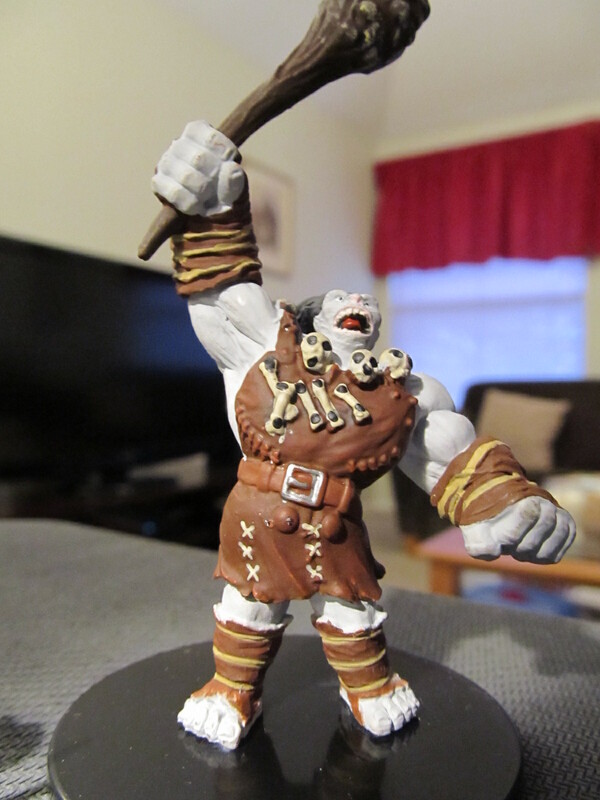 Earlier this week I read this review on ENWorld about the new prepainted plastic Pathfinder minis licensed from Paizo to Wizkids. I was in my FLGS today and they had a batch, so I picked up a large and normal booster to see what I thought. 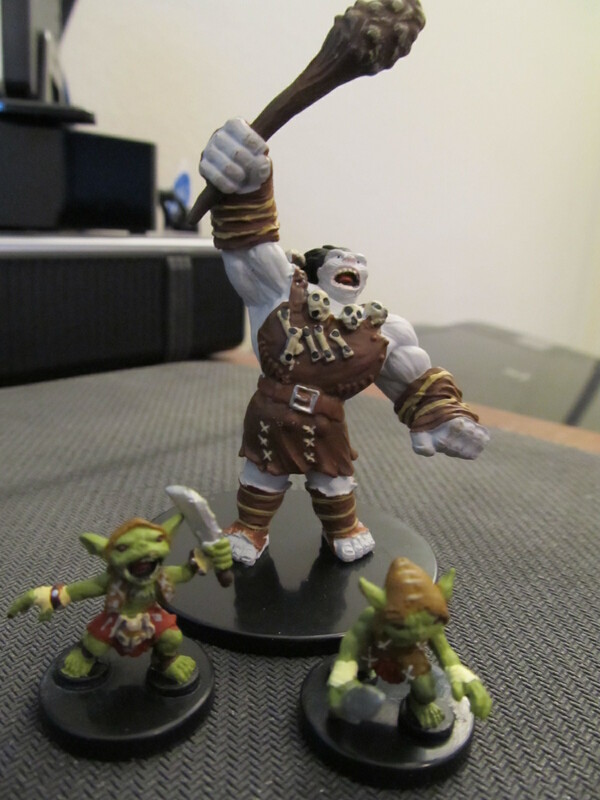 I was lucky in that my normal booster, which can have either one medium or two small minis contained two goblins, and the large booster, which has one large, contained an ogre. The goblins and ogre are very iconic monsters in Pathfinder and have a different and distinct look to them than in earlier D&D. The figures came out well – in D&D Miniatures boosters figs were usually pretty bent up, and often they don’t stand straight (either the base being bent or the figure doing the “V8 lean” on the base). 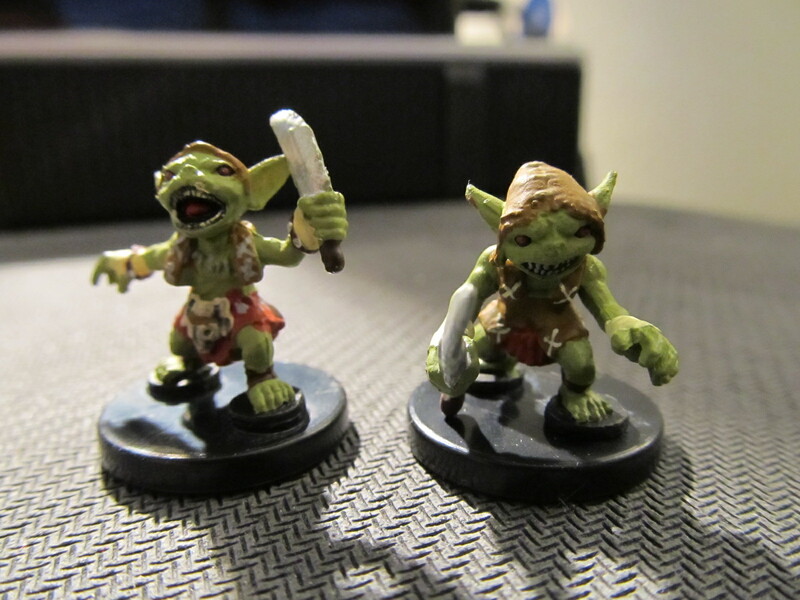 These figures have nice hard bases and the goblins’ little weapons were striaght and good-looking. The ogre’s club was slightly bent (he came out of the plastic shell while still in the box) but one bend and it was true. The sculpts are good and the paint jobs pretty detailed. The one weakness is that the big primary color they use on each mini, usually for the skin, needs a little more something – a wash or whatnot, it looks very homogeneous. Here’s some large scale pics for you to check out. The ENWorld review complained a lot about the amount of wrapping they come in. I was ready to ding them on it too, but really it’s just a box with a plastic blister in it – not even the little annoying plastic baggies that D&D Miniatures used. 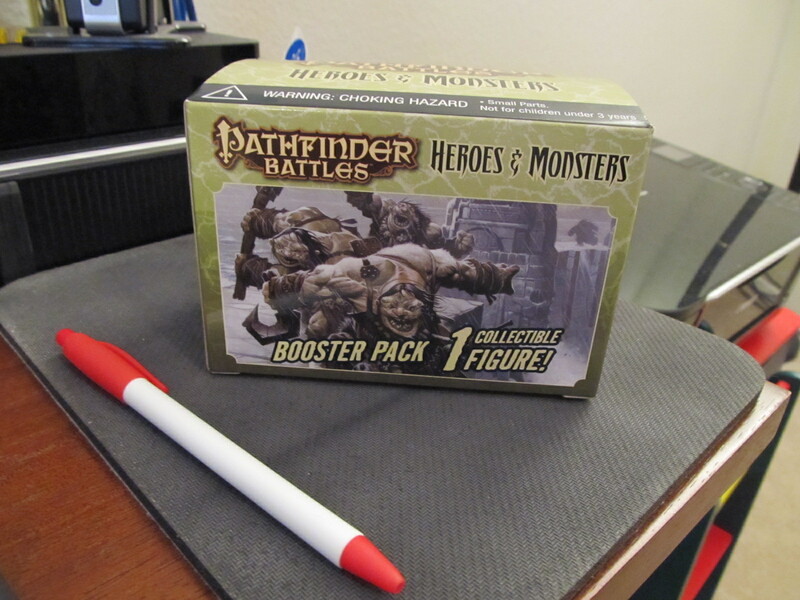 I do wish that they had boosters with more minis in them – buying one or, in rarer cases, two to a pack is a little annoying – but here’s my “trash picture” to compare to the ENWorld one. This entry was posted in reviews and tagged miniatures, Paizo, Pathfinder, plastic, prepainted, RPG, RPGs, wizkids. Bookmark the permalink. I think you’ll like the results from the brick as there are no duplicates (I think). With only two bricks, I got 31 out of the 40 possible minis. The only mini I was really dissapointed in was the druid, of course I got 2 of them. I also got 6 goblins though, which I think are awesome. I just got my brick and am well pleased. It was only $50 from RPG Locker and I got another ogre, a troll, a manticore, and a succubus as well as a bunch of other stuff. All were pretty nice! And all usable, no super esoteric BS. Two orcs, goblins, a spectre, a lizardman, a spider, a dire rat… Meat and potatoes stuff.